Right now we’re working on The Babe’s writing and number/alphabet recognition skills. 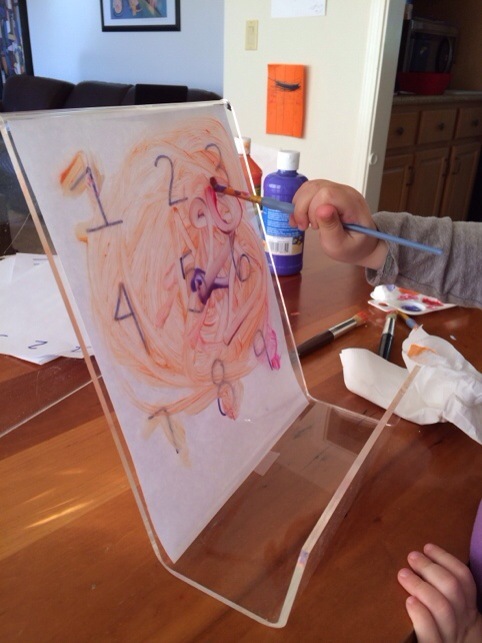 So I set up a simple painting activity on her painting easels. One of my favorite craft closet pieces are these acrylic easels that The Babe’s aunt and uncle had that they no longer used for their business. If you haven’t tried it, acrylic has an amazing texture to paint on. So smooth. So relaxing. I like to sit next to the Babe and try out my skills for a few minutes as almost a meditation moment. I poured out a little paint shaving cream (her painting media of choice these days) and whipped up some number and letter prompt sheets. A quick tape job onto the back of the acrylic and her painting invitation was set up. She had a lot of fun painting the numbers and letters, but then she had to find her right side of the brain with some free painting. I love activities that can feed both sides of the brain. Looking for some acrylic to paint on? You can buy a really expensive acrylic easel from Lakeshore Learning or you can pick up something from Tap Plastics for a lot cheaper. You could even try this painting activity on some old CD cases. How do you like to incorporate more traditional academic learning with art? Let me know in the comments, I’d love to hear.